With Maxi-Blast equipment and Maxi-Blast plastic media, cleaning feed screws is a quick one-step process. Eliminate long, tedious hours of hand cleaning. No torching, burning, or use of wire wheels. No hazardous fumes. Save time and money with the Maxi-Blast team. To ensure maximum operator visibility, dust is vacuumed from the cabinet by means of a high efficiency blower located on the clean air side of the dust collector. For easy maintenance, the dust collector is equipped with cotton filter bags with a manual shaker. Media is cleaned by passing through a vibrating screen to trap large contaminants and, simultaneously, through a magnetic separator that filters out ferrous contaminants before being stored for reuse. Reloading of media into the pressure vessel from the storage hopper occurs automatically each time the operator releases the foot pedal depressurizing the vessel. To provide for smooth flow of the low-density plastic, a 60° cone-shaped pressure vessel and hopper are standard. An adjustable valve controls the feeding of the media into the air stream. These machines feature a mobile clam shell design which enables large heavy feed screws to be cleaned quickly and safely. The rolling design allows the work area to always remain directly in front of the operator, keeping the operation efficient and ergonomically friendly. The mobile cabinet design allows for easier and quicker cleaning of exceptionally large and heavy screws. 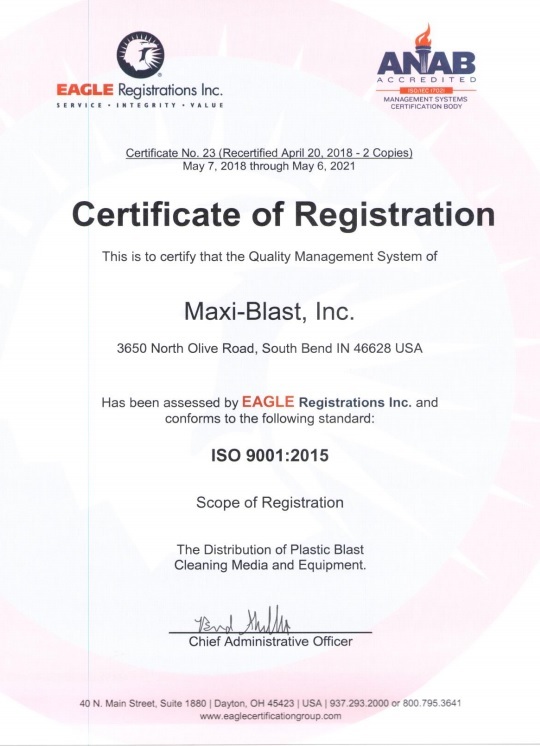 Maxi-Blast is the leader of non-abrasive plastic blast media processes for product finishing, deflashing, and paint and coating removal, as well as for cleaning metal injection molds, screws and tooling. © 2019 Maxi-Blast. All Rights Reserved.